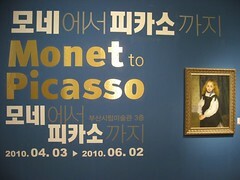 The Philadelphia Museum of Art has an exhibition on tour in Korea entitled "Monet to Picasso". 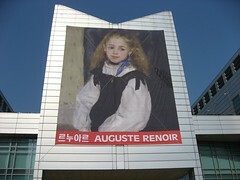 Having spent three months at the Seoul Arts Center, where it attracted over 100,000 visitors in little over a month, it's recently arrived at the Busan Museum of Modern Art in Haeundae-gu for a two-month stay. 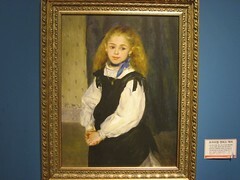 As the title suggests, the exhibition features famous masterpieces from artists such as Monet and Picasso, in addition to Cézanne, Degas, Gauguin, Manet, Matisse, Renoir and van Gogh. According to the Museum the insurance cost for the exhibition was around 1,000bn won (£586m/$894m), which I suppose puts the collected value into some sort of perspective. Given that Haeundae-gu is on the other side of Busan from us, it took an hour to get their by subway. It would have been forty-five minutes by bus, but if you have to stand that means a forty-five minute physical workout as the driver alternates between emergency braking and acceleration. Haeundae is an interesting part of Busan which has a number of places of cultural interest in close proximity - the Busan Exhibition and Convention Center for example - better known as BEXCO, is just across the road from the Museum. Unfortunately Haeundae isn't in any way centrally located, being out at the very edge of the subway network, so it isn't very convenient for many. On the other hand, given that Haeundae is the Dubai of Busan, perhaps the museums and exhibition centres are in the right place. The ticket price was 12,000 won (around £7/$11) per person. Audio guides could be rented for 3,000 won, which read an explanation for 33 of the 96 masterpieces, providing a total running time of 50 minutes. 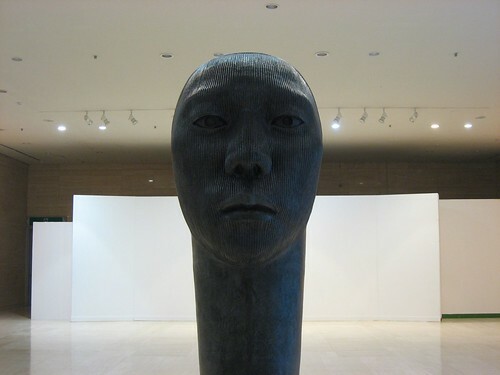 This would have been quite useful, given that beyond the name of the artist, the year of their birth and death, the name of the work and the year it was created, there was no attempt to explain anything specifically about the piece, but unfortunately it was only available in Korean. That's a shame because one can imagine the exhibition attracting tourists with an interest in art from nearby countries such as Japan and China, not to mention the English-speaking expatriate community within Korea. It's also possible to go on a guided tour of selected artwork within the exhibition, but I wouldn't recommend it. While we moved around the Museum a herd of around 40 people stomped their way around in a hot and chaotic pursuit of their guide, who had to talk from a platform with a microphone. It was clear that views of the paintings were hopelessly obscured. 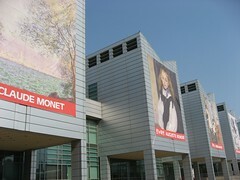 The exhibition itself was arranged into four galleries each with a separate theme - respectively Realism and Modern Life, Impressionism and Post-Impressionism, Picasso and the Avante-Garde, and American Art. Each at least had an opening explanation in Korean and English for those without audio guides. 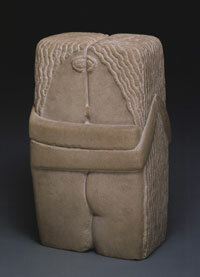 Most works were paintings, but amongst the famous sculptures were Constantin Brâncuşi's The Kiss (1916), Rodin's Eternal Springtime, and Picasso's Owl. Photos aren't allowed within the exhibit of course, although a couple of copies of the genuine paintings visitors have just seen hang on the walls of the 'photo zone'. Beyond this, the Chosun Ilbo currently has an reasonable overview in English and Korean, and the Philadephia Museum of Art's website carries information on such representative works as van Gogh's Still Life with a Bouquet of Daises, Manet's U.S.S. "Kearsarge" and the C.S.S. 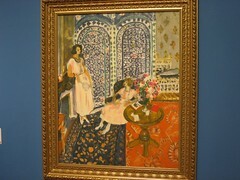 "Alabama", Renoir's Portrait of Mademoiselle Legrand, Degas' Ballet Class and Matisse's Yellow Odalisque. The nature of the audio guide meant that my wife stopped at particular paintings for much longer than others, so rather than browse each one equally I was left waiting at certain pieces and then passing over others more quickly than I might otherwise had done. Unfortunately the friends we'd arrived with were making their own pace too, so we didn't want to be holding them up at the end. After the main exhibit, we went to investigate a couple of side galleries containing the work of Vietnamese artists, and had just entered another containing a Japanese collection when a member of staff politely told us they would be closing in a few minutes. We'd entered the Museum at the admittedly late time of 3.30pm, but apparently it was now 7pm. Somehow, the time had flown by. It was a pity because there was clearly a lot more to investigate in the Museum, and while the genuine art enthusiast must consider coming face to face with an original work by the likes of Monet or Picasso as something of a pilgrimage, I was equally happy looking at the paintings of Kim Chong Hak, so perhaps a return trip is on the horizon. but I'm not overly carried away with it. Still I would like to have seen the exhibit and I did enjoy your article. Regards. I took my kids and my parents day before, I liked it. I liked the things in lower floors more, I couldn't believe how empty it was compare to philly exhibition. It is definitely worth a second tour.